I wanted to make a traditional Steak and Kidney pie for New Year’s Eve this year (yes, I am British). It has been many years since my husband and I made one. 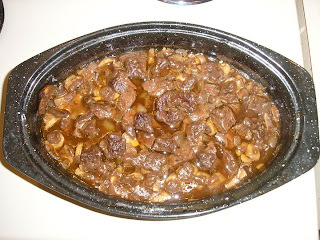 My plans, however, to get fresh beef kidney were thwarted! Apparently animal organs are not a big seller in suburban Minnesota, so butchers and grocery stores just looked at me in confusion (some, even in horror). I think that they thought I was going to perform some bizarre New Years ritual with beef livers and probably live chickens. I wouldn’t be surprised if a report was made to the authorities. 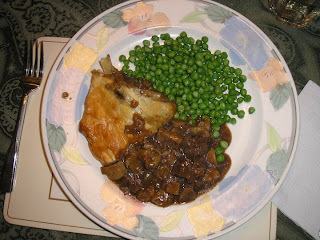 Anyways, not to be discouraged, I found a steak and mushroom pie recipe and fused it with the steak and kidney pie recipe. 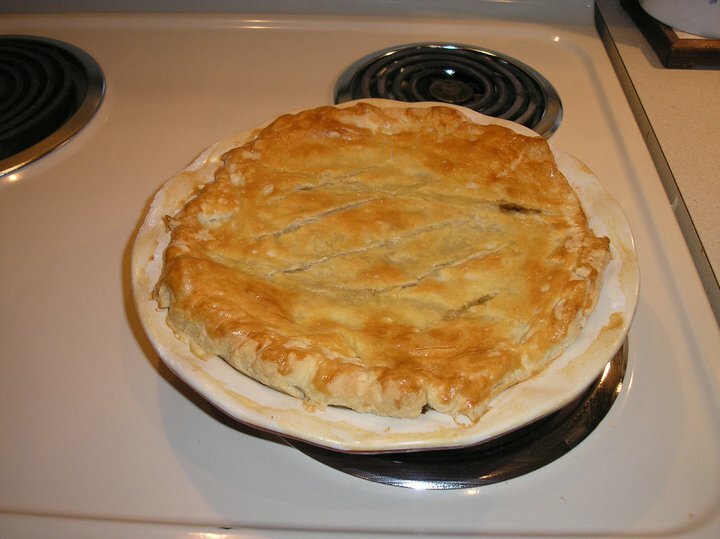 All made from scratch, except the pastry. Pastry and I do not get along. It has been a love/hate relationship for years. I love to eat it and it hates to work with me. I tried talking to it while rolling it. Smooth things out, if you will. But it didn’t matter. The pastry would always be difficult and do its own thing. Finally, in frustration one day, I picked it up in a big ball and lobbed it across the room. Scared my cat , nearly killed my husband (I can see the headline: ‘Local man bludgeoned to death with dough’) and dented the wall . Needless to say, I am banned from making pastry for health and safety reasons. But, I digress. What I present to you now is our New Years Eve baby (no live chickens or beef livers were harmed in the making of this recipe). 2. 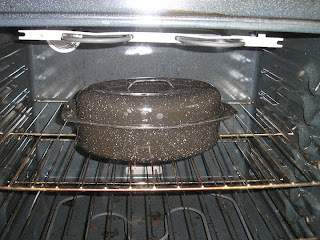 Using a large oven proof pan/pot (I used a small roasting pan), heat olive oil on a burner, med heat. 3. Chop onions and mince garlic. Saute in olive oil until lightly browned. Add butter and mushrooms. 4. In a bowl, mix flour, thyme (crush if you have the dried leaves), salt and pepper to taste. I personally tend to only use a tsp of each so the guests can season their food when they eat it. 5. Mix bullion cube into ½ cup of boiling water. 6. 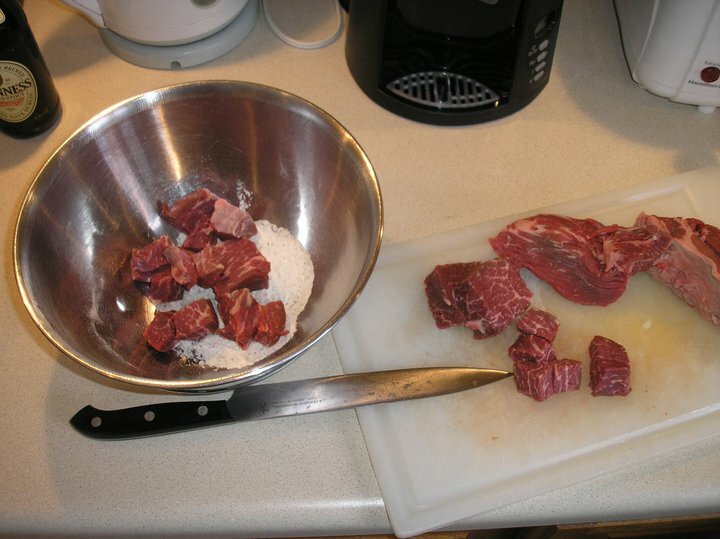 Trim the fat from the meat and cut into bit-sized cubes. 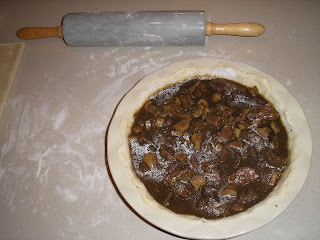 Toss into flour mixture. 7. 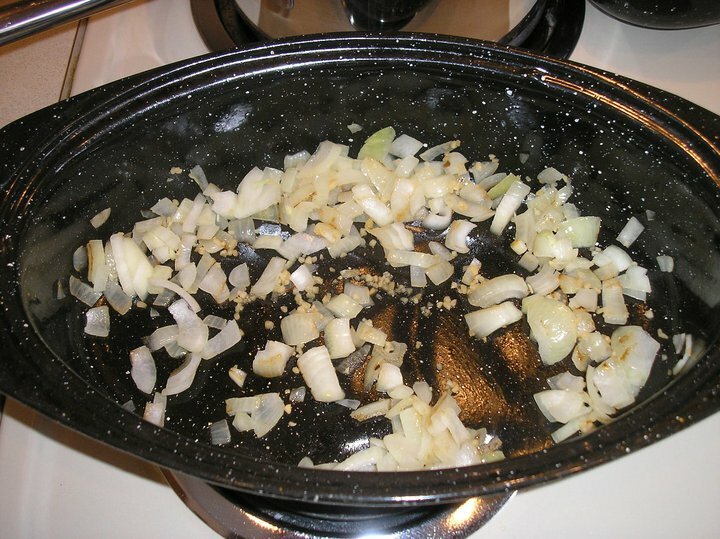 Pour contents of bowl into pan of onions, garlic and mushrooms. 8. Pour in bottle of Guiness, gravy powder, beef bullion and stir it all up. 9. 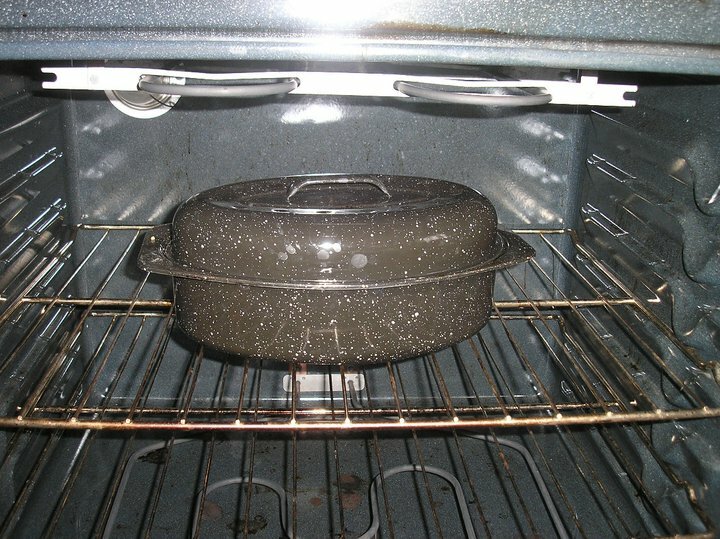 Put a lid on and place pan/pot in the oven for 40 minutes. 10. Remove from oven. Do not turn oven off. 11. Now a step I added that was in none of the recipes! Take a turkey baster and drain as much of the gravy as you can and put in a separator cup. 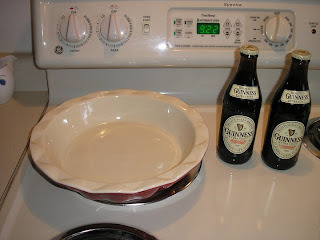 Let both the gravy and meat cool slightly while you work on the pastry. 12. 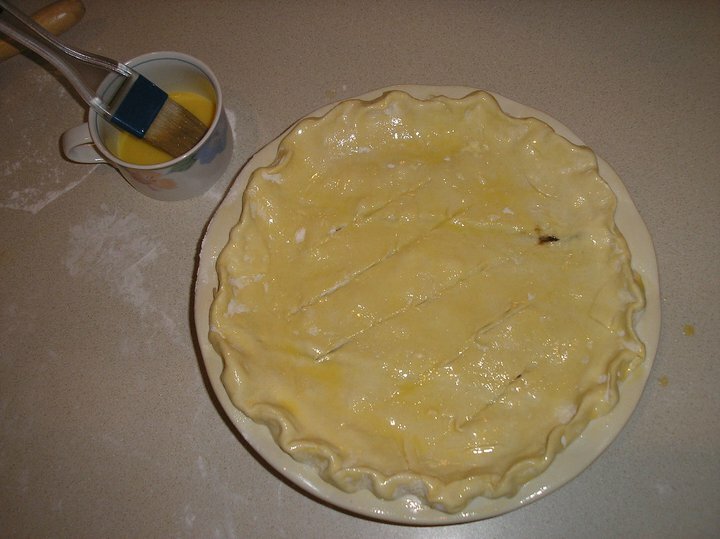 Prepare the pastry according to instructions and line the pie plate. 13. Once the fat has visibly separated from the gravy, pour the gravy (not the fat) back into the meat, stir, and pour into the pie dish. 14. 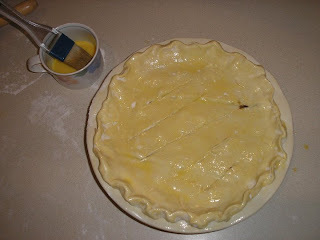 Place pastry top on pie. Whisk egg and water together and brush on pastry. Score the pastry…but do not break through it. 15. Back in the oven (still at 350) and bake for about 40 minutes. 16. It’s done when the pastry is golden brown! 17. Serve hot, with small sweet peas. My mum would have with mushy peas but I never did like them. Also, serve with the glass of Guiness…room temperature, of course. Cheers and Happy New Year! I think this picture pretty much speaks for itself. AMAZING!